Leaving aside the legalities, politicalities, constitutionalities and the complexities of the current imbroglio in which the nation is grounded (temporarily), the underlying issues in the constitutional crisis can be reduced to one single question: at a time when all three branches of the state are trapped in a deadlock without a pragmatic solution in sight, should not the people – the ultimate sovereign authority acceptable to all competing parties for power – be allowed to express their will in deciding who should be empowered to govern them? Right now the crisis is in the failure to decide who should govern the people. Rival parties are claiming legitimacy. However, all parties are agreed on holding elections. If so why not hold elections, leaving aside the legalities, politicalities, constitutionalities and the complexities? The crisis in the failed state is deteriorating at a rapid rate daily. The befuddled nation has hit rock bottom. The chaos that reigns supreme is confined to Parliament for the moment. Fortunately, the burning passions of politics have not spilled over to the streets so far. Rightly or wrongly, some attribute the prevailing disorder directly to the decision of the Supreme Court, which had a direct impact on rival parties competing for power. Though it is an interim order, without any finality about it, the immediate political consequences has been to exacerbate the polarisation of the opposing parties. This certainly was not the intention of the Supreme Court. But the unintended consequences have led to further polarisation and destabilisation of the nation. Undoubtedly, this points to the fact that decision-makers at all levels must factor in the possible unintended consequences which can throw the nation into an uncontrollable spin. Without being judgmental, it cannot be denied that all hell broke loose after Supreme Court issued the interim order to reverse the President’s decision to (1) appoint a new Prime Minister (“in his opinion”, as he did when he appointed Ranil Wickremesinghe as Prime Minister when he had only 41 MPs in a House of 225) and (2) hold general elections on January 7, 2019. In a politically charged atmosphere, some may even conclude that the Supreme Court had poured a bucket of fuel into the sparks that were waiting to blow up into an unmanageable conflagration. Primetime news globally is having a field day exposing the mayhem of the white-clad MPs going at each other on the floor of the House. There is no doubt now that if the prevailing agony is prolonged, it will lead to undermine the foundations and the future of the oldest Asia-Pacific democracy, which began in 1931 with the introduction of universal franchise. Despite allegations against the decision of the Supreme Court – and many more are due to be hurled depending on the final decision in early December -- it is also absolutely clear that, as things stand now, the only authority that can produce a solution is the Supreme Court. Though nominally it has been asked to define the law that should guide the nation in this crisis, in reality it has been asked to play a decisive political role -- perhaps the most critical in its history -- that can either plunge the nation instantly into ungovernable disorder, perhaps leading to a crisis as harrowing as the 33-year-old North-South war, which ended only the other day, or save the nation from the impending descent into hell. In this maddening crisis, the shocked, mystified and confused people are looking for a saviour. Only the Supreme Court has the power to play that role at a time when the naked power struggle is exploding in all its fury on the floor of the House. It looks as if we are in a free fall, tumbling in a bottomless vacuum, without any means to stop it. The Supreme Court, consisting of citizens of this nation, is not that naïve to hide behind the illusion of being above all that is going on now, with each day dragging the nation deeper into the depths of despair. The future is in its hands. Their task right now is also to make the future safe and liveable. It has the option to return to the fundamental political principles enunciated in the Mahavamsa: 1. make “our island a fit dwelling place for men.” (MV 1:44) and 2. Anoint the king / state that can pave the path “for the good of all” (MV 4:7). It is also in the interests of the judges to do so, because from the day after they retire they will step down into the world they are about to make. They too will be recipients of the consequences they make in early December. Of course, the Supreme Court, inter alia, will have to face myriad questions before it sits down to write the final verdict that will make or break the nation. 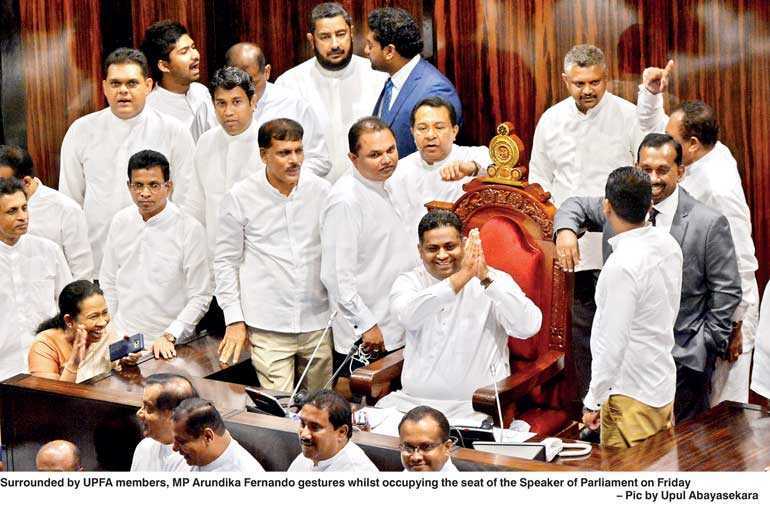 The most convulsive and dizzying issue it has to face is the “bahu-bootha Constitution”, as described aptly by the former President Chandrika Kumaratunga. Disentangling the contradictory provisions of a Constitution, made hurriedly and expediently for competing political parties to perpetuate their rule forever, will be like cleaning the Augean stables. In one sense, the Supreme Courts is asked to purify the Constitution which has been cut, chopped and twisted into a divisive and destructive tool by power-hungry politicians. This, at first sight, requires a surgical operation to remove the cancer of the powers concentrated in the Presidency and the Prime Minister in Parliament. Recent history indicates clearly that neither of the two parties can be trusted to perform their duties with commendable integrity. When the two critical branches of the power – the Legislature and the Executive – are at loggerheads, and fail to generate trust in the body politic, who then can be trusted to fulfil the duties of the State? The obvious answer is the Supreme Court, the third arm of the state. Right now all eyes are focused on the Supreme Court, wondering whether it will act as the benign and rational provider of an answer that will serve the prime interests of the people, without dipping its neutral hands in the murky and corrupted waters of politics. So the task before the Courts is daunting and yet rewarding, if it can step in to enshrine the sovereignty of the people in whose name the Constitution was made. It will have to walk a tight rope between the tangled legalities and a lasting pragmatic / people-oriented solution that would rescue the nation. It will be torn between two masters: serving the law and the serving the best interests of the sovereign people. Of the two, legal minds generally agree that the sovereign rights of the people stand way above the capricious interpretations of the unreliable law. Going to courts is like a woman going into a saree shop: when every saree is attractive, who knows which one she will pick? So which way will the Court go? Is there a guiding star for the Courts to navigate their way through a rock and a hard place? In the current crisis, it is obvious that primacy should be given, above all other considerations, to pragmatism, because the Constitution, with its contradictory dialectics, is bedevilling not only the best of legal minds, but also the future of peace and stability, putting the right of the sovereign people to return to their normal lives. The nation is not only befuddled but horrified by the legal eagles propounding contradictory interpretations of the “bahu-bootha Constitution”. Each party is emphasising the clause/s favourable to them at the expense of the other - a common practice in the legal profession. But in this complex and confusing situation, preserving the democratic norms and, most of all, serving the overall interests of the sovereign people, leaderless at the moment, should be given priority. At this moment, the Supreme Court is tasked with the unenviable mission of leading the nation out of darkness. When the other two competing branches are locked in a do-or-die battle for power, can the Supreme Court, acting as the neutral third party, rise as the saviour of the nation? It is also necessary in this confusing state, clouded with teeming questions, to define the central issue/s to find the answer/s. Coming down to the nitty-gritty, I think the following two questions are relevant: 1. Can the Head of State sack the Prime Minister who commands a majority in the House? Related to this is the other: 2. In a crisis situation where the two main branches of the state – the Legislature and the Executive – are locked in an impasse, virtually paralysing the state, should the Judiciary, the third branch, acting as the neutral umpire, decide to hand over power to the people, which seems to be the most reasonable and pragmatic way out? Those looking for answers will find the most relevant precedent in modern Australian history. At a time when the law is groping in the dark, clutching at straws, a solid precedent can be the guiding light that can lead the ship of the State to arrive safely in the harbour, without sinking in the dangerously choppy seas. The classic Australian precedent that will be outlined below can be considered to be the answer to the issues surrounding the current Sri Lankan crisis. Right now. Sri Lanka is running on parallel constitutional lines traversed by Australia in its biggest ever political / constitutional crisis. The parallels are too close to ignore. Sri Lanka is confronted with almost the identical two issues listed above. It is these two constitutional issues that threw Australia on November 11, 1975 into the bits biggest ever political confrontation between the Right and Left forces. On November 11, 1975, Gough Whitlam, Prime Minister of the Labour Government, who was in command of the Lower House with a safe majority, was heading for a crisis because he could not get his money supply bill through the Senate, the upper House, which was in the hands of the conservative Liberal Party, headed by Malcolm Fraser. Christmas was coming round the corner and the public servants and the private contractors could not be paid if he could not get the Right-wing Senate to pass the bill. Monitoring these events in the background was the CIA. Needless to say, that it was not quite pleased with Whitlam’s Left-wing foreign policy, which was not quite acceptable to the larger interests of America leading the Cold War. Whitlam boldly broke rank with the Western camp when he refused to be one of the subservient Cold War warriors, and recognised Communist China. At this time, America had blocked China’s entry into the UN. To the Western alliance, obsessed with the fear-mongering theory of “domino effect”, recognising Communist China was alarming in the ‘70s. Whitlam had also threatened to close down American bases, including the strategic Pine Gap. On top of it all, in 1974 White House sent Marshal Green, the ‘coup master’ who engineered the fall of Sukarno in Indonesia, as Ambassador to Australia. Whitlam too blundered and played into the hands of the Right-wing opponents waiting to overthrow his Labour Government, with his rather amateurish but enthusiastic Left-leaning politics. His Government was riddled with financial scandals. His popularity was waning in the electorate. It was against this backdrop that Whitlam went in the morning of November 11 to the residence of the Governor-General, Sir John Kerr, who was suspected of having links to the CIA. Earlier Sir John had joined the Association for Cultural Freedom, a right-wing group financed by the CIA, and conspiracy theorists accused him of being in the pay of CIA. Whitlam was going to offer the Governor-General a solution to break the deadlock, by offering to hold half senate elections hoping to get a majority in the Upper House. But Sir John, who was handpicked by Whitlam, had other ideas. He was going to appoint a Right-wing caretaker Government led by the Opposition Leader, Malcolm Fraser, and hold a general election as the way out. It was a classic power struggle within a parliamentary democracy. But how was Sir John, the representative of the neutral Queen who had to be consulted, going to resolve the crisis? Could he sack the Prime Minister who was in command of the majority in Parliament? Could he appoint the Leader of the Opposition as the care-taker Prime Minister? Could he declare a general election asking the people to decide the next step? Was he prepared to do a Pontius Pilate and wash his hands off, allowing the rival parties to battle it out? Or was he inclined to play a partisan role favouring the pro-American political leader? In his opinion, the State was corrupt and dysfunctional, lurching from crisis to crisis, unable even to deliver money to pay its functionaries. So did he overstep the democratic and constitutional norms in sacking a Prime Minister who had a majority in the House? Was he right in handing the final decision to the people and wait for their verdict? Though liberal political passions of the day were bitterly opposed to him, did history eventually absolve him for pulling the nation out of the quagmire by handing power to the people to deliver their verdict and make democracy function again? One of the primary tests of a democracy is when the State honours its moral and political obligation to consult the people periodically, or as and when it is required by law. However, if a state, paralysed by internal tensions and divisions, is heading towards a critical crisis with no end in sight, is it the duty of the Head of State to go before the people as the neutral and final authority to deliver a final verdict? If there is a log jam, someone must intervene to open up space for the non-violent and natural flow of events for democracy to regain its strength and function with vigour. There can be nothing undemocratic, illegal or immoral about the State consulting the people, the sovereign base from which all democracies derive their power. This is precisely what happened on November 11, 1975 in Australia. The Governor-General, Sir John Kerr, sacked the Prime Minister, Gough Whitlam, Labour Party, and handed over power to a caretaker Prime Minister, Malcolm Fraser, the leader of the biggest party in the Opposition which, “in his opinion”, had a chance of winning power in both Houses. If the people’s verdict goes against the caretaker Prime Minister, then the status quo ante returns. Of course, there were behind-the-scene manoeuvres that influenced Sir John to sack the Prime Minister. They did cut a deal to protect the interests of Sir John in his retirement. That apart, what is most relevant is the drama that was played publicly on the political stage. Both parties agreed that the solution was an election. But they differed on the nature of the next election. Whitlam wanted only a majority in the Senate to get his money bill passed. So he offered half an election for the Senate, hoping the people will give him the majority he needed in the Upper House. Fraser, on the other hand wanted a full election, hoping to overthrow the unpopular Labour Government. Both Whitlam and Fraser were locked in a power struggle and neither was willing to budge. Sir John, rightly or wrongly, stepped in and sacked the Prime Minister and appointed the Leader of the Opposition as the caretaker Prime Minister. Elections were held and Fraser won. Australia returned to normalcy and stability again. This, in broad outline, is how Australia came out unscathed from its biggest constitutional crisis. By now discerning readers would have detected sufficient similarities in Australian and the Sri Lankan constitutional crises. An internal crisis was reaching its critical point in Sri Lanka. The President stepped in first to prorogue Parliament and later to sack the Prime Minister and hold elections. Of course, there are some significant differences in details. But, in essence, both constitutional crises find common ground on the central issue: can the head of a democratic state (the Executive) sack a prime minister who cannot deliver despite his majority in the House (the Legislature)? How is he going to make the dysfunctional state, bogged down in sordid politics, serve the larger interests of the disillusioned people lost without a promising future? Can the Prime Minister be allowed to impose his arbitrary will, abusing and subverting democratic parliamentary norms blatantly? Besides, the Yahapalanaya Government was riddled with scandals of corruption, with more than a nudge-and-a-wink from the Prime Minister. He had taken the corrupt State to an irreversible and dysfunctional point, dropping the nation into a state of permanent crisis. The future seemed bleak. So can an immoral majority in Parliament be allowed to run a dysfunctional State? Only the incontestable laws of mathematics do not recognise morality. It is dictatorial and has the divine power to rule with the sheer force of its immutable numbers. But how moral is a State run on pure numbers? The morality that underpins good governance should necessarily rise way above the games of numbers which can be manipulated with money. A Parliament must be redeemed from corrupt manipulations driven by numbers alone. The Australian crisis began and ended within one afternoon. Time was of the essence. Whitlam came back from the Governor-General’s residence and passed a vote of confidence in the House with a majority of ten. But it could not be handed over to the Governor-General in time. By the time the Speaker was admitted to the residence of Governor-General to convey the House’s message to Sir John (he was held up at the gate for a long time by the staff of the Governor-General playing for time) it was too late. Parliament had been dissolved. The proclamation dissolving Parliament was read on the steps of the Parliament by the Secretary to the Governor-General. Elections were held on 13 December. The crisis was over and democracy and stability was restored. Does all this ring a bell? In the latest Sri Lankan example, however, the Opposition had time to go to the Supreme Court and obtained a stay order for the elections gazetted to be held on 7 January. The deleterious consequences are quite apparent even to a blind man’s dog. It is in the light of the current state of chaos that the Australian experience provides an indispensable sense of direction. Australia has established the precedent of dissolving parliament in time of crises, overriding limitations imposed by law, and giving the sovereign people the right to decide their future. It has worked effectively. This is where a precedent gains the validity of a moral force as great as the law. The backbone of the unwritten British Constitution has been accumulation of pragmatic precedents. Precedents have translated into conventions and parliamentary traditions and come to rest as the bedrock of the British Constitution. It has gathered a force as great, if not greater, than the written law. The time-tested precedents can also provide solutions to vexed issues polarising and destabilising democracies. The Australian precedent is the best people-oriented and pragmatic solution available to the nation in this hour of need. Our “bahu-bootha Constitution” provides clauses / arguments for both contending parties to push their partisan interests with co-equal legal force. Legal eagles are looking up to the Supreme Court to pick one or the other clause that favours their political interests. Any decision it takes on the pure legalities is bound to damage its image. Besides, it will end up as an exercise in futility as any legal interpretation of a flawed and a highly controversial Constitution will be seen as a partisan and divisive act that will not solve the crisis. Also appointing a lame-duck Prime Minister who will be powerless to move in any positive direction in the remaining 18 months will only exacerbate the prevailing chaos. The respect and the neutrality of the SC will be enhanced only if it acknowledges the Australian precedent and cut short the prolonging of the prevailing agony. The sobering consequences of the Australian precedent has established that, more than the contradictory law, which can be influenced, swayed and re-written by foreign and moneyed forces, it is the people who must be given the right to express their will, within the shortest possible time, to prevent destabilisation and blood baths. In a democracy the right of defining and creating the future lies solely with the people and not with any branch of the state trapped in their divisive and destructive politics.